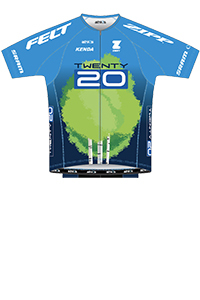 Larissa is excited to be returning to Team Twenty20 after spending the past 4 years racing cross country mountain bikes for team Ridebiker Alliance and dabbling in road racing with team Twenty16. Before beginning her professional career, Larissa was a member of the National Championship winning UC Davis collegiate teams. After graduating with a degree in mathematics and a single subject teaching credential Larissa moved to southern California to teach high school, and accidently became a mountain biker. Along with teaching full time Larissa trained her way to a few US Cup podiums, and multiple other pro mountain bike podiums/wins. In 2016 Larissa had the opportunity to represent the US at XCO World Championships as well as a few other World Cup races overseas. But it doesn’t matter where the race is, Larissa loves racing bikes anywhere in any condition, and can be spotted in any race smiling from ear to ear. Until Spring of 2015 Larissa has always held a full time teaching position, as well as coaching/ advising the school’s High School Mountain bike team. This fall Larissa has spent a good deal of time substitute teaching, coaching women’s mountain bike clinics, and renovating a cabin in a Southern California canyon with Felt engineer husband Brendan. What inspired you to become a bike racer? One of my first real dates with my (now) husband was UC Davis cycling team training camp in Bodega Bay, CA. I was surprised with my ability to keep up with the faster women on the team, and also fell in love with both the freedom/ suffering the road bike offered as well as the boy who took me out to such a beautiful place. Collegiate road racing was the perfect introduction to racing bikes because the team aspect of scoring points made all team members valuable and because the WCCC has a super strong women’s contingent. All those strong collegiate women inspired me to train and race! Who is an inspiration to you in your life, both on and off the bike? Molly Van Houweling/Beth Newell and Phil Mooney. Molly and Beth are both super strong women who race in NorCal and hold full time jobs. When I feel overwhelmed and tired I am inspired by their hard work and I strive to have their level of dedication. Phil is the most positive, happy, encouraging guy I know, and he inspires me to uplift others the same way he always makes me feel like a rock star. In Mammoth for XC nats I was introduced to these rice bowls with kale, beets, shredded carrots, tahini and runny fried eggs. I’ve been making them at home with all kinds of veggies and eggs from my chickens. The best thing about being a bike racer is? Every time someone says I inspired them to race, or any time someone emails me to ask for advice. I LOVE the idea of inspiring others and to be able to share what I’ve learned. I want other cyclists to experience the exhilaration I feel when training and racing! What is your biggest accomplishment on the bike? Persevering through and podiuming at Iron Biker Brazil in 2015 was a pretty huge accomplishment. I arrived in Brazil the morning of the first stage, and the airline lost my bike so I rode a borrowed hardtail with a broken fork, and shoes that were three sizes too big with different pedals than I am used to. I got attacked by an angry swarm of wasps halfway through the second stage and had 2 flats on day 3. I think this is my most notable accomplishment because I wanted to quit so many times throughout the three days, but I feel like I dealt with each setback as well as I possibly could, and managed to finish the weekend smiling/on the podium. Favorite place you’ve raced your bike and why? XCO worlds was in Nove Mesto in the Czech Republic this year. There were 50,000 fans cheering for us during the race and they looked up my name from my number plate, and cheered for me by name. It was the coolest feeling being deafened by the roaring crowd! Favorite cross training or off season activity? I love gardening, but only really get to do it in the fall/winter when there is no bike race traveling. It works out pretty well living in SoCal though because all the fall veggies do so well with our sunny winters which means I frequently get to harvest dinner from my front yard! Best tip for a new bike racer? Make sure you are always having fun! It’s easy to get too caught up in expectations and pressure, but you’ll perform better if you’re smiling and a little relaxed. What are one of two things that you do daily that are the key to your success? I think having a pretty clean diet (eating lots of plants and eggs!) as well as smiling as much as possible are the keys to my bike racing success! If you weren’t bike racing what would you be? I LOVE teaching high school math, so I would be teaching full time again. Tricking kids into enjoying Algebra is my jam. TWENTY16 has an emphasis on education with the initiation of our Junior Scholarship program in 2015. Why is continued education important? Although it can feel like riding bikes is all that matters, it’s so valuable to be well balanced. It’s not easy to make a living off cycling and once you retire, or if a serious crash takes you out of racing, having a solid education can be the key to another career. What is something that nobody would know about you?